This morning, a pod of five harbour porpoises was seen swimming in London's River Thames, near the Houses of Parliament. A team from the Marine Policing Unit says the animals were first spotted as they passed beneath the Tower Bridge, some 50 miles from the ocean. Police report that the porpoises do not appear to be distressed. #dolphin update. The porpoises seem happy enough. They are surfacing regularly and are staying in the Westminster area. No good pics yet.- MPSonthewater (@MPSonthewater) December 6, 2013The latest sightings indicate that the pod is continuing to move upstream towards Battersea Station in London's south zone. 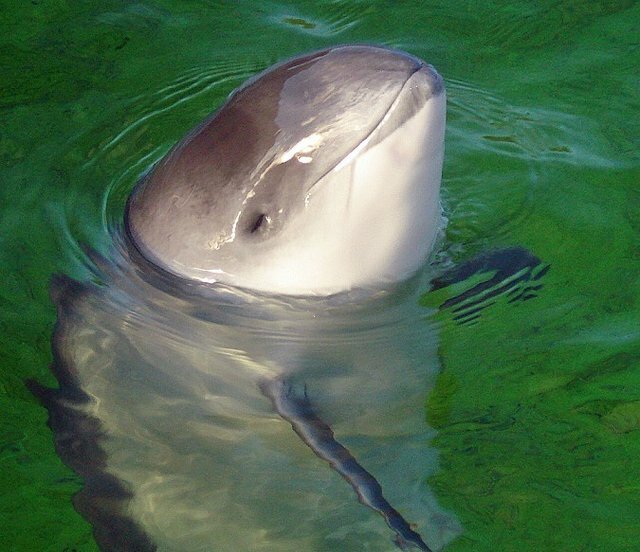 Harbour porpoises, a close relative to dolphins, are known to pursue fish into riverways -- but experts say that it is unusual to see the species venture this far up the Thames. Marine conservationist Stephen Mowat tells the Guardian that a recent storm surge may have pushed the animals upstream, and that they should have no trouble making their way back out to sea eventually. #dolphin update. The porpoises seem happy enough. They are surfacing regularly and are staying in the Westminster area. No good pics yet. The latest sightings indicate that the pod is continuing to move upstream towards Battersea Station in London's south zone. "They should be fine, they can find their way up river and go back down again. As soon as they've had their fill of fish they will find their way back out." UPDATE: London's Marine Policing Unit released this first photo of one of the porpoises.